Cultural ecosystem services (CES) are “non-material benefits people obtain from ecosystems”. These benefits include recreation, aesthetic enjoyment, and spiritual fulfillment arising from the interaction between cultural and natural features. 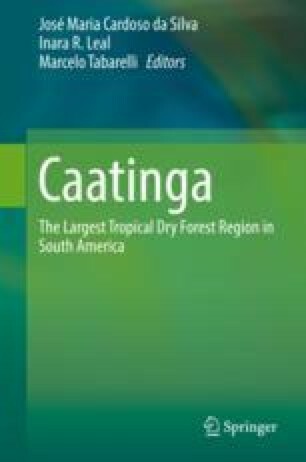 In this chapter, we describe the role of the Caatinga—a unique semiarid region located in northeast Brazil—as a source of cultural inspiration, recreation, knowledge, and spiritual significance. Firstly, we define and discuss the current conception of CES, exploring available approaches to measure them. Secondly, we reframe the Caatinga as a biocultural environment, created and maintained by the dynamic interactions between human communities and the landscape. We then identify and discuss the CES provided by the Caatinga, by combining a review of key literature and a novel big data approach based on content analysis of geo-referenced digital photographs. Finally, we critically evaluate the current state of knowledge about CES in the Caatinga, recommending multiple approaches to assess and quantify cultural values. Studies of CES in the Caatinga are only just beginning, but are critically important to demonstrate the enormous contribution of this unique environment to local cultures and the regional economy in the face of increasing land-use competition.